We present a new volumetric method for reconstructing watertight triangle meshes from arbitrary, unoriented point clouds. While previous techniques usually reconstruct surfaces as the zero level-set of a signed distance function, our method uses an unsigned distance function and hence does not require any information about the local surface orientation. Our algorithm estimates local surface confidence values within a dilated crust around the input samples. The surface which maximizes the global confidence is then extracted by computing the minimum cut of a weighted spatial graph structure. We present an algorithm, which efficiently converts this cut into a closed, manifold triangle mesh with a minimal number of vertices. 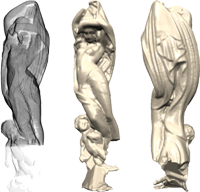 The use of an unsigned distance function avoids the topological noise artifacts caused by misalignment of 3D scans, which are common to most volumetric reconstruction techniques. Due to a hierarchical approach our method efficiently produces solid models of low genus even for noisy and highly irregular data containing large holes, without loosing fine details in densely sampled regions. We show several examples for different application settings such as model generation from raw laser-scanned data, image-based 3D reconstruction, and mesh repair.